ocorti (Homepage) wrote: very nice. Exposurre, focus and subject.... well done. I also like the colors. Frida (Homepage) wrote: Magnificent macro shot. Cerstin (Homepage) wrote: Oh, soo wonderful - magnificamente macro. cako (Homepage) wrote: Wonderful snail photo ... fantastic colors and lighting. Mindy (Homepage) wrote: Gorgeous. Perfectly framed. Divine colors. Vincenz (Homepage) wrote: That's a really cool macro. I like it! Martin (Homepage) wrote: Nice detail, colors, curves, for me perfect! Giò (Homepage) wrote: Eh si, confermo che sei un mago anche nella fotografia macro! Ian (Homepage) wrote: The purple/lilac colours are really quite wonderful. Lovely image. Susan (Homepage) wrote: Amazing shot...the clarity, colors, and tones are incredible! David H-W (Homepage) wrote: Superb shot! Love the detail and the violet tone of the shot. Well done - one of your best pieces of work! Niels (Homepage) wrote: Wow, great. Love the colors and the compo. Arjan - PlasticDaisy (Homepage) wrote: Really majestic! Like he's walking on velvet :) Great clarity! Florence (Homepage) wrote: I'm really impressed by the quality of your work. There's a huge collection of utterly magnifiscent pictures in your portfolio. Wow ! Olivier (Homepage) wrote: Baveux à souhait ;-) très belle image et magnifique traitement. LGB (Homepage) wrote: This is amazing! No words, just love it! Marie (Homepage) wrote: superbe compo, avec de bien belles couleurs. Beat (Homepage) wrote: beautyfull makro and colors too! Congratulations! 613photo (Homepage) wrote: Love the purple. Snails kind of creep me out, though, haha. Good shot. Rachael (Homepage) wrote: The minute details & colors are stunning. I so love the purple in this photograph. Craig (Homepage) wrote: Great macro shot and the colours are amazing! BoB (Homepage) wrote: Splendido accostamento cromatico, fantastica foto. Xavier Rey (Homepage) wrote: beautiful colors and shot ! grant (Homepage) wrote: hard to believe such a strange thing actually exists on this earth. beautifully photographed! Alice (Homepage) wrote: Very nice. Great detail, colors and composition. Nicely done. Zing (Homepage) wrote: Wow, amazing details and colours, great shot! sherri (Homepage) wrote: I'm in awe. It's quite beautiful and your capture is amazing. Katrin (Homepage) wrote: Wow an awesome macro shot. What is it the snail is sitting on, some kind of mushroom? Marcie (Homepage) wrote: Stunning macro. Awesome and incredible color..texture..detail. WOW..WOW...WOW! Andres (Homepage) wrote: Amazing image. Beautiful colours. ceanothe (Homepage) wrote: Magnifique, vous êtes un grand photographe ! Turnbill (Homepage) wrote: Wow - beautiful image. The colors are striking. dewaun.simmons (Homepage) wrote: Wow, what a gorgeous palette of colors here. 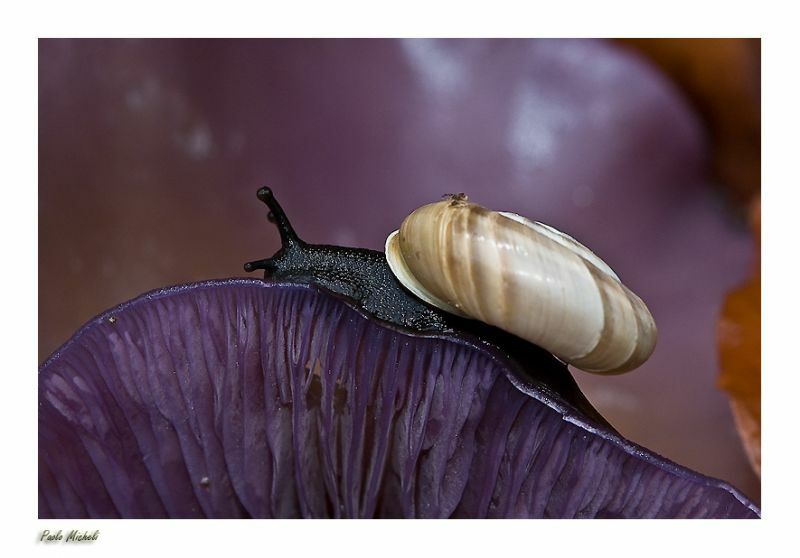 A purple mushroom, a black snail and a tan/brown/white shell... Great!!! beanow (Homepage) wrote: Super colours, frame and exquisite invoices... Great shot! Laurie (Homepage) wrote: This is ASTOUNDING! So beautifully done. The detail is really amazing. Elaine- (Homepage) wrote: i'm speechless how beautiful this is..
Pere Chuliá (Homepage) wrote: Preciosa imagen y genial composición. El nivel de detalle es impresionante y las tonalidades de color son delicadas y elegantes. Gran imagen. Bellisima. Saludos. Giovanni (Homepage) wrote: Fantastica!! Bellissimi i toni violacei e la composizione dell'immagine. Bravissimo!